People use the words “tenacious” and “driven” to describe me and, in fact, that’s why I got hired by a well-funded startup to cover the New England territory as a Director of Sales. But, my desire to prove myself had me blind to the stumbling blocks I was inadvertently putting up for buyers. Hard to admit, but my sales tactics were actually getting in the way of reaching an agreement. Virtually all my prospects were overwhelmed by smaller budgets, fewer resources, and reduced headcount. I knew that I needed to distinguish myself from every other rep trying to sell them a product. My challenge was to to be viewed as a trusted advisor who could solve their problems. It was clear that I wasn’t cutting it. In the end, I found indecision to be my primary competition. It wasn’t that my prospects were turning to competitors, they just weren’t making any decisions and the sales cycle kept dragging on. As a start-up, cash flow is life or death, so I needed to figure out how to accelerate sales and revenue – and I needed to figure it out fast. Be realistic in how I priced our enterprise software solution, and think beyond price as the primary issue on the table and to include other value we could offer – such as payment plans, implementation consulting, and service packages. I came to see that honing my negotiation skills was essential not only to my success, but also the success of my buyers and my company. Greg’s candid account about what he did to boost his stalled sales performance speaks to the value of negotiation as an essential sales skill. That’s why I am sharing it with you. Greg’s situation is not unique. In fact, stories like his motivate us here at the Program on Negotiation (PON) at Harvard Law School. We are dedicated to helping sales reps and managers master negotiation skills to outperform their peers and exceed their quota. That’s how they win, how their company wins, how their client wins, and how we measure our success. That’s exactly why we pulled this special report together. You can download a complimentary copy of our special report, Sales Negotiation Training: Essential Negotiation Skills for Sales Professionals, right now! Discover how to boost your power at the bargaining table in this free special report, Sales Negotiation Training: Essential Negotiation Skills for Sales Professionals, from Harvard Law School. Effective sales negotiation means a mutually beneficial outcome that earns you respect as a trusted advisor as well. Curated from the Negotiation newsletter, this report contains the most important and the most relevant information for sales professionals. In seven pages, we highlight critical sales negotiation strategies and skills. Accelerate your ability to close deals with this free Special Report from the Program on Negotiation at Harvard Law School. Sales Negotiation Training: Essential Negotiation Skills for Sales Professionals is a fast-reading report from the Program on Negotiation at Harvard Law School. It’s an invaluable collection of the most popular articles from our well-read monthly newsletter, Negotiation, written for business leaders. If you’re like most sales people, you want to cut right through to the most important information. 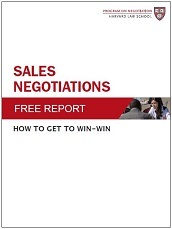 Proven insights that generate results are what you’ll find in this Sales Negotiation Special Report. That’s why I recommend you download your free copy of this Special Report, Sales Negotiation Training: Essential Negotiation Skills for Sales Professionals. Simply click the button below. I am sure you will be glad you did. Here’s to negotiating well and beating your sales goals! P.S. Whether you are a sales person or lead a sales team, honing your own or your team’s negotiation skills is the key to closing more deals faster. Get your complimentary report today by clicking on the link below. Negotiation training is a must for every serious sales pro. Thanks! I am very interested in receiving some information on Negotiation training that is offered, on line, classroom and potential other mediums.